Greece – This time it’s personal…. We asked Coreco’s Rob Gill to cast an eye over the latest events in Greece. Just what is going on? Events in Greece over the summer have fascinated and appalled in equal measure. High drama, at times even higher farce, and near or even actual tragedy for Europe and the Greek people. The incredible characters involved, from charismatic, revolutionary underdogs to the most powerful men and women in politics and global finance. Plus Francois Hollande. It’s sure make a great book one day, a “Too Big to Fail” style-novel would make great reading by the pool….or maybe that’s just me. 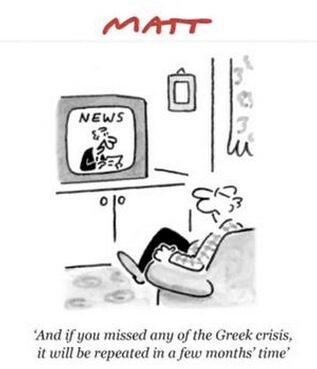 The excitement may not be over however with every possibility of a second instalment of the Greek crises. While Greece is now receiving funding once again with their banks open and, despite some rebellion amongst MPs, new austerity packages approved by the Greek parliament, a recent poll by Bloomberg found that 71% of economists think Greece will exit the Euro in 2016. Economists tend to be a gloomy lot, often revelling in drama and misfortune, but this concern is more than mere schadenfreude. In order to understand the reasons why, it’s useful to look at the big picture, or the “narrative” as economists like to call it. Firstly, rebellion is still in the air. The Greek people overwhelmingly voted “Oxi” in their referendum on the initial austerity package, only to see their parliament approve an even harsher one. Given all the talk about “the home of democracy” at the time of the referendum, it’s hard to see how this won’t come back to haunt politicians in Greece, and ultimately Europe, at some point in future. Secondly, Greece simply cannot pay back all the money they owe. The figures are eye-watering with national debt at around 170% of GDP, double that of the UK. The damage and suffering this debt burden have caused have been well documented, and it is telling that even the IMF have started calling for debt-relief. The austerity required to even “extend and pretend” is crippling the Greek economy and this cannot go on indefinitely. This however clashes with the third reason Grexit seems an ongoing risk and the real crux of the matter: Moral Hazard. Put simply, if Greece are let off even part of their debts, why wouldn’t other Eurozone countries demand the same? Ireland, Portugal, Spain and Italy are all undergoing their own versions of painful austerity, to get their debt burdens down and stay as functioning members of the Eurozone. The perhaps understandable concern of Northern Europe, ably spearheaded by Germany leading the “Nee” camp, is that if Greece is granted debt forgiveness while staying in the Euro, others would demand the same. Thus, in their view, any debt forgiveness must have grave consequences “pour encourager les autres”, such as some form of Grexit. So while, for the time being at least, “Manyana” has won the day with the can being kicked down the road yet again, this seems very much like a pause rather than the solution the Greek people very much deserve. Both the economists’ outlook, and more significantly the sheer dynamics of the situation, almost certainly mean we’ll be back for another summer blockbuster next year. Whether the economists are right and Greece does eventually say “Ciao” to the Euro only time will tell. More drama seems inevitable though and in the meantime I’ll be waiting for the first instalment of that novel.